MANILA, Philippines - State weather bureau PAGASA on its 5pm weather bulletin Friday, October 2, 2015 said that 'Bagyong Kabayan' (international name Mujigae) has gained more strength as it continues to move towards the West Philippine Sea. 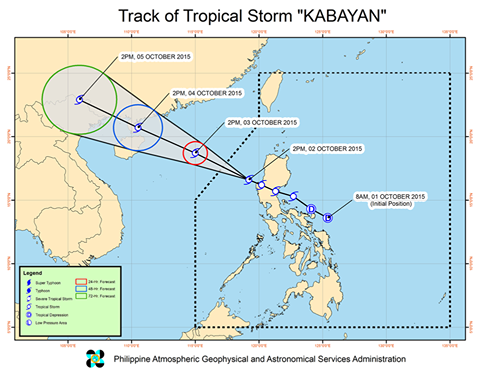 At 4:00 PM today, the center of Tropical Storm 'Kabayan' was estimated based all available data at 205 km Northwest of Dagupan City, Pangasinan (16.6°N, 118.5°E). It has maximum sustained winds of 75 kph near the center, gustiness of up to 90 kph and forecast to move West Northwest at 20 kph. 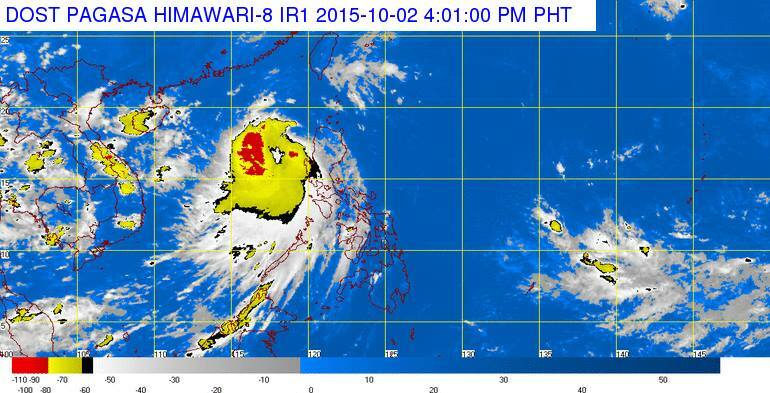 PAGASA said that its is expected to exit PAR tonight (11PM -1AM). All public storm warning signals are now lifted. 24 hour (Tomorrow afternoon): 590 km West of Laoag City, Ilocos Norte or outside the PAR. The estimated rainfall amount is from moderate to heavy within the 300 km diameter of the Tropical Storm. Occasional rains will be experienced over the provinces of Bataan, Zambales and Pangasinan. Sea travel is still risky over the Northern and Western seaboards of Luzon.